The True Origin of Death Note... Ancient China? Recent archaeological evidence support the theory that concept of Death Note originated in ancient China. With two successful movies and an anime series, Death Note, written by Tsugumi Ohba and illustrated by Takeshi Obata, has become a household name to anime and manga fans. In 2006, dedicated Japanese fans discovered a one-shot story called The Miraculous Notebook by Shigeru Mizuki, which some claimed was the inspiration for Death Note. However, recent archaeological evidence suggests that "Death Note" may have existed in ancient China long before the birth of Japanese comics. 死亡筆記 (Death Note) is said to be China's oldest "book of the dead." Similar to the Egyptian Book of the Dead, which contained instructions on the rules and spells of afterlife, the Chinese Death Note was used to "guide its users to the afterlife." According to ancient Chinese texts, there existed a book that would "act as a guide to the afterlife to those whose names are recorded in it." "Ample evidence does exist of early cultures in the Yellow River Valley, where legend holds that the Chinese language and imperial system took form under a mythical Yellow Emperor 5,000 years ago." It was said that the Yellow Emperor created a certain notebook of death as a tool to enforce the newly established imperial system. As time passed, "Death Note" was passed from rulers to rulers. While many scholars believe the "notebook of death" found in many texts is nothing more than a regular book, many suggested the possibility that in the old days, when people were still heavily superstitious, those who possessed the Death Note were able to instill fear into their subjects and opponents. The presence of "Death Note" can be felt in many Chinese literatures and records. A notebook of death was mentioned in a poem about Qin Shi Huang's search for immortality. According to an old Chinese tale, during the Three Kingdoms period (220–280), Shu strategist Zhuge Liang used a certain notebook to create confusion among rival Wei forces and their commander Sima Yi. So where is this "Death Note" now? 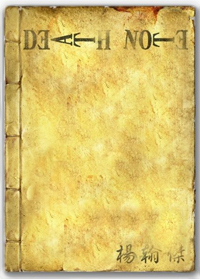 Many experts are frustrated by the lack of material evidence of a "Death Note" in modern day China; some say such a notebook was simply another superstition passed down from the older generation, while others believe that the book was destroyed or lost during the Cultural Revolution (1966–1976), when countless ancient artifacts, antiques, books, and paintings were destroyed by Red Guards. Despite the manga's recent troubles in China, it would surely surprise the teachers and parents that the concept of Death Note actually originated in China. Submitted by mitch on Sun, 2007-04-01 10:34. Submitted by che (not verified) on Wed, 2007-05-02 23:51.
i want to know if this is true.. please give me more informations. thank you very much. Submitted by Anonymous (not verified) on Thu, 2007-05-03 17:54. Submitted by Anonymous (not verified) on Wed, 2007-08-22 08:32. Submitted by eXoticPirate (not verified) on Wed, 2007-09-12 16:16.
hehe... interesting but there's nearly no way for us to know... if it's real... god!!!! Submitted by security systems (not verified) on Tue, 2008-10-14 16:04. There are lots of stories about the Death Note. Most of them very fictive and you can't believe anything but still are nice stories to hear. But still are some stories that could be real. Submitted by Anonymous (not verified) on Fri, 2008-10-31 00:08. Death Note in China - Success or Disaster?